Energy investors find that it is impossible to have a discussion about national oil companies (NOCs) without shining a light on OPEC. By the end of 2011, more than 80 percent of the world’s proven oil reserves rested in the hands of the 12-member oil cartel. OPEC was created in the 1960s by five founding members: Iran, Iraq, Kuwait, Saudi Arabia, and Venezuela. At the time, international oil companies ruled the world’s oil supply. The ten largest NOCs are in OPEC. Only one of them, however, holds all the cards: Saudi Arabia. 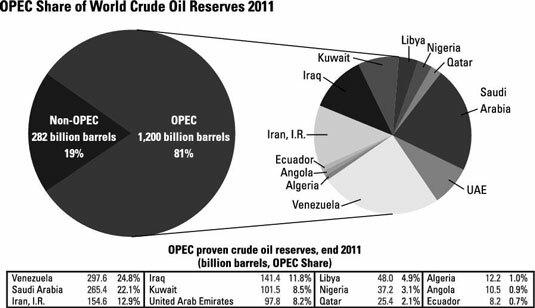 This figure breaks down OPEC reserves by individual members. Saudi Arabia’s Ghawar oil field is the largest of its kind. Considered a super-giant oil field, Ghawar pumps out a monstrous 5 million barrels per day and has been in production for more than 60 years. Four of the top ten oil-producing countries in the world are OPEC members — Saudi Arabia with 10.5 MMbbls/d, Iran with 4.2 MMbbls/d, United Arab Emirates with 2.8 MMbbls/d, and Nigeria with 2.4 MMbbls/d. Because OPEC members raise and lower their production targets and quotas based on the current supply and demand, the amount of spare capacity has become a major issue. Spare capacity refers to the ability of a country to produce more oil. Basically, will OPEC be able to increase production in the event of a supply constraint? This is a more serious problem for OPEC than you may first think because the only member with significant spare capacity is Saudi Arabia. In the event of a supply constraint, the entire world is relying solely on Saudi Arabia to turn on the taps and pick up the slack. Failure to do so would result in a spike in oil prices. Although you can’t directly trade state-owned oil companies in OPEC like Saudi Aramco, the 12-member cartel can provide vital information and greatly influence global oil markets. Periodic meetings can swing oil prices in both directions depending on any changes in production. Don’t confuse government-owned national oil companies with multi-national corporations, which are simply companies that operate in more than one country.